Tony Rutter’s breath taking 1973 250cc/350cc double victories established the diminutive Midlands rider as a firm favourite with the Irish fans. The return of the North West 200 to the road racing calendar, albeit as a National event, produced, “some of the best road racing ever seen in this country”1. The meeting, ran on the modified course, shortened to 9 miles 1257 yards, got off to the worst possible start when thirty one year old Graham Fish lost his life after crashing in practice. Saturday’s five race programme began in subdued style with Jackie Robinson leading a well strung out field home at the end of the low key, three lap, 200cc opener. A first lap of 88.53 mph pulled Robinson six seconds clear of nearest rival Courtney Junk, and from there he simply cruised home to win the only 200cc race ever seen on the Triangle circuit. In contrast, the 250cc race quickly developed into a classic as Tony Rutter and John Williams swapped places at the front for the entire five laps. With Ray McCulllough’s Yamsel refusing to fire on the line, the task of upholding Irish honour fell to Tom Herron, who held off the attentions of Rutter’s close friend and travelling companion, Barry Randle, to finish third, well behind the two way dice at the front. With the advantage sea-sawing between Williams and Rutter, new records were inevitable. On the third circuit Rutter edged in front, lapping at 105.05 mph. Williams stayed with him, and as the high speed duel crested Quarry Hill for the final time it was the red and blue figure in front. But the glory would be Rutter’s, as he pulled from his rival’s slipstream to set the fastest lap of the race at 105.97 mph, and cross the line, a bike’s length in front. Rutter opened 350cc proceedings with a lap of 106.48 mph, and then upped the pace with successive laps of 111.37 mph and then 112.44 mph, to build an unassailable lead, as the expected challenge from John Cooper evaporated when his Yamsel expired on lap four. The leader board saw little change as the race progressed, and Rutter freewheeled across the line, well clear of Williams who claimed the runner-up spot by 0.2 seconds from Randle. The 500cc and 750cc races, ran concurrently, produced victories for Billy Guthrie and Geoff Barry after the early front runners in both classes were forced out through mechanical failure. After three laps John “Mooneyes” Cooper held a commanding lead over the 750cc field, but over the next two circuits, Seeley-Norton mounted Geoff Barry caught and passed the slowing BSA. Hampered by fuel starvation problems, Cooper fought back, and held a four yard lead as they began the final lap. In the end it was all in vain for Cooper as Barry romped home well clear of the Norton of Wilfie Herron, with Cooper trailing home in third. 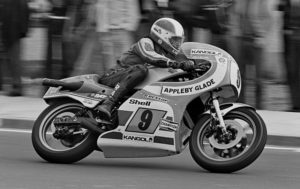 For the opening three laps of the 500cc race it looked as if the North West 200 victory that had proved so elusive over the years, was at last within the grasp of Billy McCosh. A worsening misfire in his Suzuki proved terminal on lap four, and with fancied runner Ray McCullough’s QUB2 Seeley already sidelined, Billy Guthrie (Yamaha), took the win from Sam McClements and Manx rider Danny Shimmin. 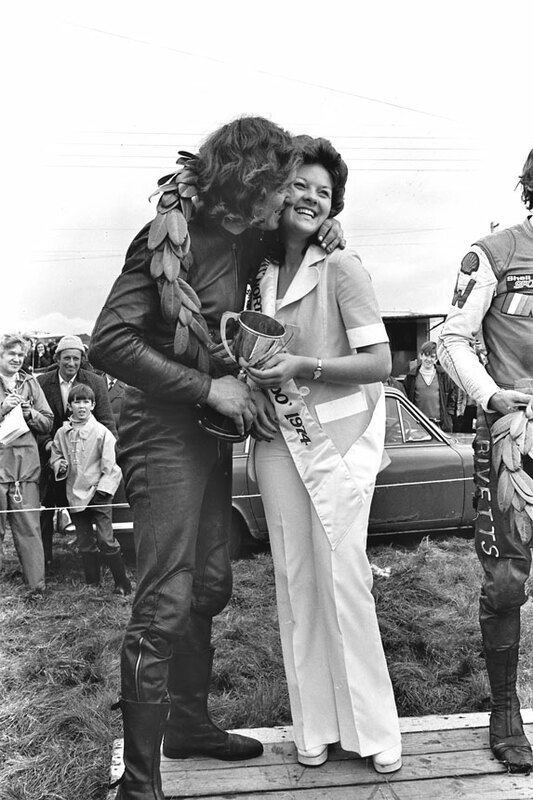 On Saturday 18th May 1974, John Williams became the first rider in the history of the North West 200 to score a hat-trick when he rode to three wins on one day. Williams’ days work also included a new absolute course record, and second place in the 250cc race. Williams began the day with a start to finish 350cc win, that left the opposition floundering in a wall of spray, and thrilled the sodden crowd that thronged the length of the waterlogged course. On roads made treacherous as the rain came down in stair-rods, Williams led by the proverbial mile at the end of lap one, peering in vain into the gloom behind him in search of opposition who were nowhere in sight, as he set out on his second circuit. Down the field the atrocious conditions wrecked havoc. “ When I started racing, the Manx Grand Prix was the pinnacle, I didn’t even think about the TT in those days, it was too far in the distance. I eventually rode at the TT and won my first one in 1973. I got an offer to ride at the North West 200 in 1974. I was very excited about it, and was there with my new found friend, John Williams. We’d rode together in the factory Honda team at the 24 hour race in Belgium, went there and won and became great friends after that. The weather for practice in 1974 was glorious, and I remember having a sort of workshop down by the Sea Splash Hotel, (Portstewart), and working down on the rocks on the bikes with Phil Haslam. We were in our shorts because the weather was so nice, but how it changed for that Saturday. It poured down with rain, and Phil crashed right in front of me at Mathers Cross. I’d led the race from the start, but between Shell Hill, (there was no roundabout then), and at Mathers, first John (Williams) and then Phil came by me. As he came past there was an unbelievable wall of spray, and coming out of Mathers there was no sign of him at all. It was just as if he’d been plucked into the air by the hand of God. Phil broke his hip and was out of racing after that for some time. Mathers Cross saw the demise of many riders prior to my time racing there and since. Wayne Gardner almost crashed in front of me there. I was following him and Rob McIlnea around there and Wayne hit the bank on the inside and was very lucky to stay on. Williams mastered the conditions to head Tony Rutter home by almost two minutes, with Billy Guthrie completing the top three, a further minute clear of Mick Grant, another North West 200 debutante. On drying roads, part two of Williams’ history making hat trick came in style, with a 500cc victory at a winning average of 105.33 mph, and over one and a half minutes in hand over namesake, newcomer, and runner up, Charlie Williams. Starting the final lap, Billy Guthrie held a clear seventeen second advantage over the third place man, but a broken crankshaft relegated him to fifth place in the end. As the 250cc grid lined up the sense of expectation, of history about to be made, hung heavy in the air. It was not to be as Williams fought back from fourth place on lap one, moving ahead of Grant and Charlie Williams by lap three, only to be denied by “The Dromara Destroyer”, Ray McCullough. McCullough’s ride completed a record of winning at every race meeting in Northern Ireland, including a celebrated Ulster Grand Prix win in the rain around a slippery Dundrod in 1971, over a world class field that included Phil Read and Jarno Sarrinen.